You Thought Your Feet Were Just For Walking! It's easy to use. There are 4 modes (play, record, demo and playback). The volume is as fully adjustable. I love the automatic "power off" system that helps you save the four AA batteries the mat requires. 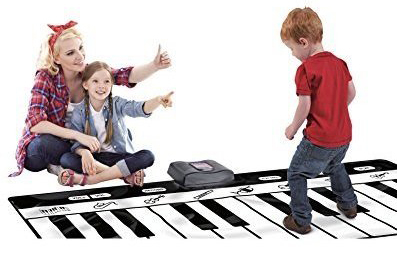 This is a fun activity for the entire family. Oma really appreciates when a toy camouflages a teaching moment. Batteries not included. This touch sensitive playmat folds and then fits back in its flat box for easy storage. Music is one of the great joys of childhood, and kids who learn music are proven to do better in skills like science and math. 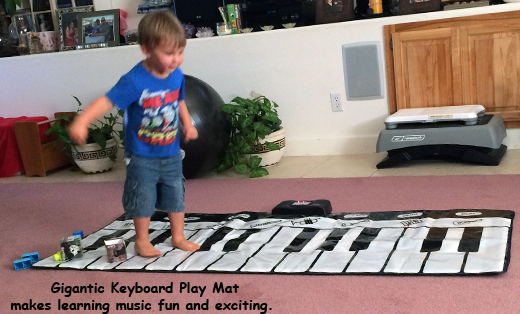 This Click n' Play Gigantic Keyboard Play Mat makes learning music fun and exciting.